We can probably all agree on one thing: hops = happiness. So in honor of ales, lagers, pilsners, porters and more, we put back a few and compiled this beer-themed bucket list of must-visit breweries in and around town. THE BEER: Extensive info about the 18 listed beers - including the Wit, Pale, IPA and Pecan Porter, which are together known as the "Core Four" - can be found here. But, you know: tasting > reading. TASTES & TOURS: There are two tour options (11 a.m., 12:30 p.m.) most Saturdays, and $10 tickets are available for purchase here. THE BEER: Adelbert&apos;s produces Belgian-style, bottle-conditioned ales using malted barley, Noble hops, and fresh yeast. Think awesomely named options like the Naked Nun, Black Rhino, Scratchin&apos; Hippo and more. TASTES & TOURS: Their tasting room is open Wednesday - Friday from 5 - 10 p.m., Saturday 1 - 10 p.m. and Sunday 1 - 7 p.m. Tours happen Friday 6 p.m. and 7 p.m., Saturday 2 p.m. and 3 p.m. Their tasting room also has darts, ping pong, and a foosball table, with food trucks outside. THE BEER: You&apos;ve likely seen (aka drank) the "Core Four" - Fire Eagle, Black Thunder, Pearl Snap and Peacemaker - around town, and they also have tasty seasonal options like Heavy Machinery, their seasonal IPA series. TASTES & TOURS: During tasting hours, you can drop by and grab a beer at the brewery. Actually, for $10, you technically get three beers. And a free glass. No RSVP required. THE BEER: The house beers are designed by the brewers based on the wants of owners, and are broken down into three categories: Rational, Irrational and Finite. You can get the sweet deets here. TASTES & TOURS: Black Star doesn&apos;t do tours/tastings, per se, but they do put on plenty of interesting events that include happy hours and tap takeovers. THE BEER: The folks at Blue Owl Brewing (led by Black Star Co-op alums Jeff Young and Suzy Shaffer) focus solely on sour mash beers. Their beer lineup includes the Spirit Animal, a sour pale ale; Van Dayum!, a sour red ale, and Professor Black, a sour cherry stout. Their goal is to bring sour beer to the masses by creating approachable styles. THE BEER: Circle Brewing goes back to the basics, building upon the principles of the German Purity Law of 1516 (Reinheitsgebot), and only utilizing four ingredients: water, malt, hops, and yeast. Here you&apos;ll find four year-round beers, plus seasonal brews that vary by the... you know... season. TASTES & TOURS: Drop in to try one... or, you know, two... during tasting room hours (Fridays from 5 - 8 p.m., and Saturdays and Sundays from 1 - 5 p.m.). THE BEER: This World Beer Cup Gold Medal-winning craft brewery is dedicated to sustainability and has six high-quality beers on their list —plus dog treats made from spent grains (because your pup deserves a drink of sorts, too). TASTES & TOURS: The taproom is open every day from 8 a.m. - 10 p.m., while (free!) 45-minute tours take place at 5 p.m. on Thursdays and Fridays, and 1:00, 3:00 and 5:00 p.m. on Saturdays, and sometimes include exclusive samples. TASTES & TOURS: "Pay no attention to that brewmaster behind the curtain!" ...is what no one at all will yell at you during your visit to Independence. Come by the tasting room to see where the liquid magic is made and to try exclusive offerings during the following hours: Thursdays, 5-9 p.m.; Fridays, 4-9 p.m.; Saturdays, 12-6 p.m.
TASTES & TOURS: Tours and tastings —accompanied by food and music—take place on Saturdays, from 1-7 p.m., and Sundays, from 1-5 p.m. Which, we believe, are the makings of a pretty wonderful weekend. THE BEER: Think an extensive list of so-called "wild ales and spontaneously fermented beers" - from Thrash Metal to Das Überkind - brewed in the beautiful Hill Country. TASTES & TOURS: The tasting room is open Fridays from 4-10 p.m., Saturdays from 12-10 p.m., and Sundays from 12-6 p.m. Interested in a free tour? You can make that Jester King dream a reality at 6 p.m. on Fridays and 1:00, 3:00, and 5 p.m. on Saturdays and Sundays. THE BEER: Four Live Oak beers are offered year-round (including their popular Hefeweizen), while they also have an array of seasonal brews and limited offerings that are sure to please your palate. TASTES & TOURS: The brewery is only open to the public when they are conducting tours (which ring in at $10 per person), and upcoming events and the link to purchase tickets can be found here. THE BEER: At Oasis, you&apos;ll have four smooth options to choose from all the time, plus - if you&apos;re lucky - the Lake Monster, which is brewed one batch at a time and, we&apos;re certain, tastes better than it sounds. TASTES & TOURS: The taproom is open from 11:00 a.m. until 5 p.m., Thursday-Saturday. For the rest of May, tours will run on Fridays at 3:00 p.m. and 4:00 p.m. and Saturdays at 1:00 p.m. and 3:00 p.m., while beginning in June, tours will run on both Fridays and Saturdays at 1:00 and 3:00 p.m. Check here for updates. THE BEER: Once you learn how to pronounce Pflugerville, we suggest heading there to visit Rogness Brewing Company and enjoy a few of their beers, which are brewed in small, handcrafted batches. Opt for one of the eight year-round creations, or (fingers crossed!) one of the 10 limited edition and seasonal options... the details of which kind of depend on the season. TASTES & TOURS: Rogness is more of a production brewery, but if you want to get your beer straight from the source, you can come by their taproom on Thursdays from 6-10 p.m. and Fridays from 4-10 p.m. THE BEER: Do good while you drink, um, good. This 100% philanthropic production brewery has four everyday beers "to enjoy today" plus six special occasion beers "to enjoy today or tomorrow." Personally, we suggest today... YOLO and all that. TASTES & TOURS: The brewery is open Fridays from 3-6 p.m. and Saturdays from 12-5 p.m., and you can enjoy your beer - along with, thanks to their BYOF (bring your own food) policy, some snacks - either in the taproom or outdoors on the grounds. TASTES & TOURS: Thirsty Planet is open every Saturday from 11 a.m. to 3 p.m., and the tour schedule reservations can be found here. Or you could just take the virtual tour... if you&apos;re into that kinda thing. THE BEER: Their family of Tex-Mex Beer (trademark, btw) features five options, including the Fuego, a jalapeño pilsner that rings in at 6.5% ABV. TASTES & TOURS: Head out to Dripping Springs to try four-ounce samples ($2.00 each) in the tasting room, which is open seven days a week (Monday-Thursday: 1-8 p.m.; Friday, Saturday: 11 a.m.-8 p.m.; Sunday: 12-6 p.m.). It&apos;s worth the commute, swear. THE BEER: The beer lineup includes the Honey Saison (made with Round Rock honey), the Pale Ale, Session IPA, and Extra Special Bitter, a Texan take on an English classic. They recently launched their Coffee Milk Stout, featuring coffee from Austin roaster Summermoon, with hints of chocolate, caramelized sugar, and vanilla. Know another awesome spot? 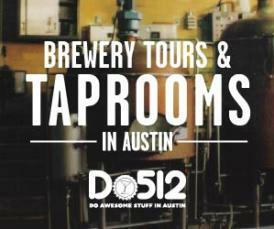 Drop us a line at do512@do512.com!